The ARWA has for many years supported an Annual Golf Tournament Fundraiser in support of the John A. Garrett Scholarship Fund. The Scholarship Program was governed by a Board of Directors consisting of Vickie Watkins, President; Mike Norris, Vice President; Randolph Hall, Secretary/Treasurer for the organization of this tournament. The ARWA Board of Directors established a Scholarship Fund named the “John A. Garrett Scholarship Fund.” This fund was organized for educational promotion of water and wastewater related careers throughout the State. It provides an opportunity to support professional development in water and wastewater fields of expertise. To insure continued growth in the number of certified water and wastewater operators in the State of Alabama, some of the scholarships will be offered to individuals striving to enhance their professionalism by attending Alabama Water or Wastewater Operator Certification Courses for Grades I-IV certification examination preparation. This is offered to expand the educational opportunities of those individuals interested in water and wastewater industry careers. We hope you will take advantage of this opportunity. Please support our efforts and make your contribution today! The Annual ARWA Fundraiser for the Scholarship Fund is a Golf Tournament held in conjunction with the Association's Annual Conference. This major event is the financial backbone of the Scholarship Program. We encourage everyone to contribute to this worthy cause as a tax-deductible contribution. The Fund is organized as a 501(c)3 charitable organization. To receive scholarships for eligible applicants annually as financial resources permit. Scholarship funds can be used for continuing education courses, certification programs, courses and programs at two year and four year public and private institutions of higher education. 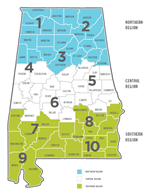 To insure continued growth in the number of certified water and wastewater operators in the State of Alabama, some of the six scholarships will be offered to individuals striving to enhance their professionalism by attending Alabama Water or Wastewater Operator Certification Courses for Grades I-IV certification examination preparation. This is offered to expand the educational opportunities of those individuals interested in water and wastewater industry careers. We hope you will take advantage of this opportunity!